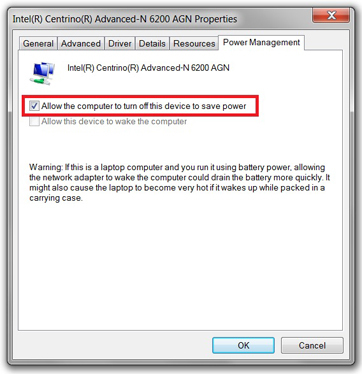 Turn off your Bluetooth if you are not using it. Go to Power Options → Advanced Settings → Wireless Adapter Settings → Set to Maximum Performance. 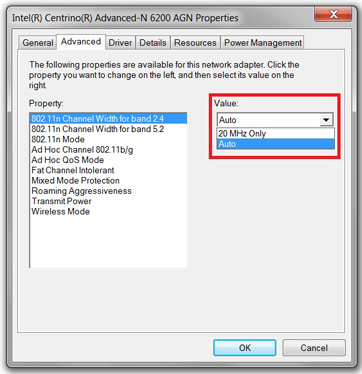 In SSID Wireless Netwrok Properties, select Connect even if the network is not broadcasting its name (SSID). Does the Wi-Fi signal strength improve? If not, please continue and follow the steps below. Note: The interface and IP address depends on the router’s manufacturer. In the address bar, type the IP address of your router and then click on Go or press the Enter key on the keyboard. Note: For the IP address, please refer to your router's user manual. Login page will appear. Please enter your username and password. The router setup page will load in your browser. Please locate and edit the wireless settings. Change the wireless channel to 6. Click on Save Settings or Apply Settings button.